Planning a holiday party is almost as fun as attending one! If you are party planning for the holidays, there are endless options for fun and stylish hosting. 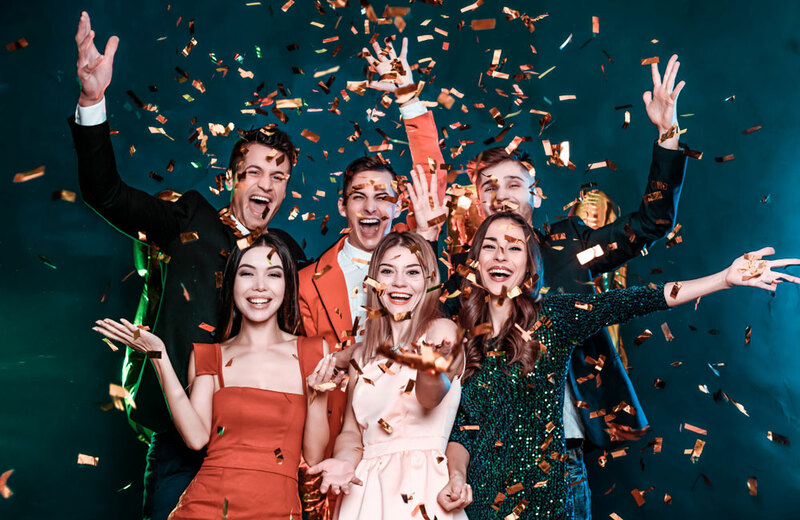 So get ready, because the team at The Alleen Company is here to offer fun and exciting ideas for your next holiday party! Read on to learn more about hosting a memorable holiday party, and reach out to our team for more professional advice! Whether for grownups or for kids, fun holiday themed beverages are a great way to get the party going in holiday style! If you are hosting a Christmas party for friends and family, consider offering a Mojito Mint for the adults and a Shirley Temple for the kids. The red and green colors will evoke the spirit of the holidays, and the delicious and fun flavors are sure to please adults and kids alike. Check out our beverage glasses available to rent for your party! There are few things more fun than preparing holiday themed snacks for friends and family! From green and red sprinkles atop tasty Christmas inspired cupcakes to spooky ghost cookies, deserts are a great place to start! Design a holiday menu that sparks your creativity! From the perfect lighting to festive holiday decor, themed decorations are the perfect way to create the atmosphere you want for your holiday event. Our new bistro lighting might be just what you are looking for to add a stylish touch to your outdoor party. We can also transform a space using drape and LED lighting! It doesn’t take much to make your guests feel special, and fun holiday-themed gifts are the perfect way to do it! Use your imagination and choose items that will remind your guests of the fun you’ve had together for years to come. Whether your guests prefer the spooky or the serene, there are plenty of fun games that can be played at your next holiday event. Holiday party planning can include themed games for kids, for adults, or both! From gift giving games like Secret Santa to spooky Halloween scavenger hunts, a holiday themed game is a great way to make your event memorable. Whether you prefer scary Halloween costumes, silly Christmas sweaters, or classy New Year’s Eve attire, choose a theme for your holiday party and create an atmosphere your guests are sure to remember! There’s nothing more memorable than group photos with all your friends and family in holiday outfits! Choosing the right time for your holiday party can make or break the event! It can be difficult to synchronize schedules with your guests so that everyone can attend. So, take a little extra time to pick the right date and time for your event — with plenty of notice — so that everyone can RSVP with a resounding yes! The location you choose for your party is just as important as the refreshments and decor, so plan ahead and pick the perfect place! For a family-friendly Halloween event, it may be best to host at home, so everyone can relax in a comfortable setting. A New Year’s Eve bash may be best held at a stylish restaurant or event venue, to elevate the pomp and circumstance to maximum effect! If you would like to have an outdoor event, consider renting a tent! From the moment you begin party planning, it is important to create something that inspires you on a personal level. If you choose themes and decor that speak to your inner sense of beauty and fun, your event is sure to please your guests as well. Be true to yourself and create something that is uniquely you to share with the people you care about. The holidays are about coming together and spending time with the people you love. Make your friends and family feel special by party planning with your guests in mind! Whether you prepare thoughtful gifts for each guest at your Christmas Holiday Party, or you offer a photo booth for guests to create fun and spooky memories at your Halloween Holiday Party, taking the time to plan for your guests is a great way to make the event feel special — and your guests will feel special too!